Break is here, now what? Holidays are great fun as everyone has the opportunity to slow down and take a break from our normal, busy schedules. This can be tough for kids who strive on structure and routine. Adding in some special projects, art, and traditions can help make holidays that much more enjoyable. 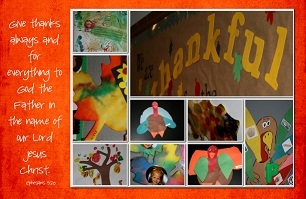 *With the beautiful change in leaf colors, how about creating your own with some Q-tip painting? *Kids love to color (and it gives you a chance to work on your cooking/baking) what if their coloring sheets were family pictures? *One of the best things about having young children is beginning new traditions. 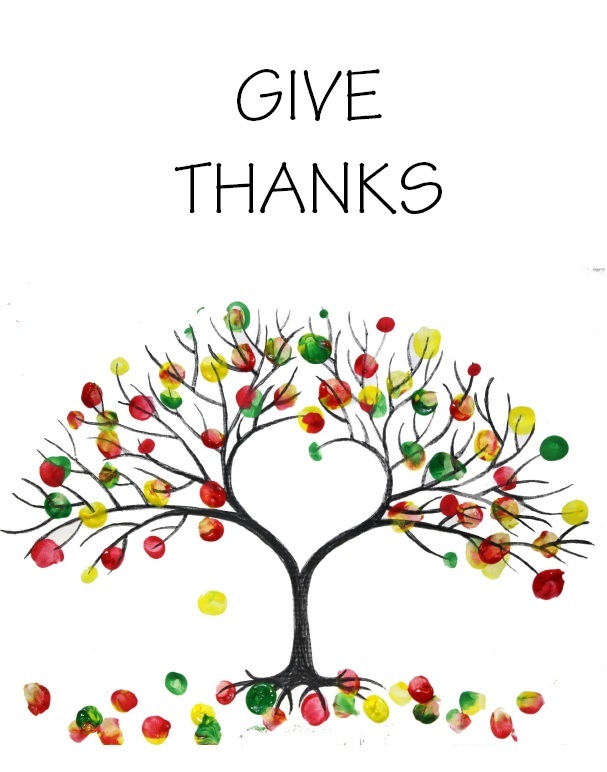 I love this family’s thankful tree. *And speaking of family traditions, instead of taking a nap after your big dinner, how about family olympics? *Kids love to cook… and kids love playdough…. combine the two and make some! *Can’t get the kids to eat? Then let them play with their food with these funny printable face plates. Categories: Parenting, Uncategorized | Permalink. It’s a done deal! Our fall fundraiser projects are finished and ready for distribution! I love seeing the children’s artwork transformed into beautiful and meaningful notecards. THANK YOU to everyone that ordered these. Please let us know if you have any questions about your order. I also LOVE seeing everyone’s “rules” for their homes. How fun that many of you purchased the Family Rules prints as gifts too! As those of you with the Brown and Cream prints are finding out, we had some issues with the printing. PLEASE let us know if the two print options we gave you do not work. We will gladly find a solution and make changes as needed. I LOVE and appreciate the dedication of all the members of our Preschool Board! It is appropriate during this season of Thanksgiving to say THANK YOU to each of them for their thoughtful input and hard work throughout the year. I also send a big THANK YOU to Office Depot. They printed and cut the cards at a very discounted price. We appreciate their support! We hope you enjoy your personalized items. Are you talking about this idea before the actual day for thanksgiving? 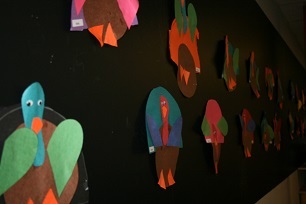 Young children feel much more comfortable sharing and talking about the idea of giving thanks with some practice before the holiday. While we should focus on things we are thankful for everyday, I encourage you to do this often between now and next Thursday. You can even think of unusual things to be thankful for such as knees. My goodness, think about it, how would we walk if we didn’t have knees that bend? What a great activity for the drive to preschool or the time waiting for an appointment. I am thankful for the unique miracle of each child. I will share my thankful heart with our God. Thank you God for children with their joy, enthusiasm and innocence. Thank you God for the way they ask deep questions with great seriousness such as “Ms Cyndi, do you have a belly button?” Thank you God for their energy and the prompt for me to keep moving – just to keep up. Thank you God for silly faces (our Purple class is especially good at this – watch for a class picture soon.) Thank you God for a child’s gentle touch as they mold their sweet little hands into mine while we walk together. Thank you God for each child and the unique person that they are. God, you are the master of creation and I greatly admire your handiwork in making each precious, unique child. We had a wonderful staff in-service this week on Sensory Processing Disorder. As I listened to the information I strengthened my belief that sensory play is a valuable and necessary experience for young children. I will let Shelly Todd share more in-depth information about the Sensory Processing Disorder. In the meantime, I found an interesting article on Eduguide.org. It states the following, “Recent child development research suggests sensory play builds nerve connections in the brain’s pathways, which helps the brain develop. These experiences are basically food for the brain. They lead to more complex learning tasks, so that children are able to do more complex learning.” You can see the whole article at http://www.eduguide.org/library/viewarticle/1779/. Many people hesitate to dive into sensory experiences. They are often messy. However, with a little planning, you can minimize or at least contain the mess. Place a tarp under really messy play. With a small dust pan and brush children can help sweep up some of the mess. Use large cookie sheets or cutting boards under the play. 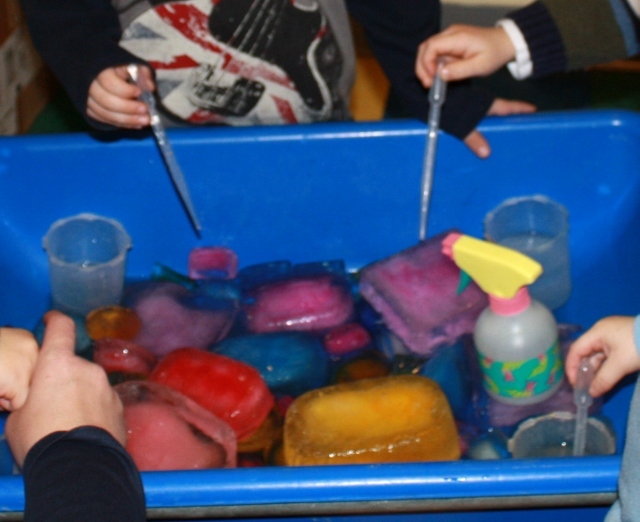 Use a small plastic pool to help contain the messy play. Limit some play to the deck or garage (during winter months). All that being said, I encourage you to GO FOR IT! Some children relish this type of play with great enthusiasm. Others will be more timid. Persevere! It is so important. Perhaps it is those timid children who would benefit most from repeated exposure. I believe a young child’s brain craves this kind of input. 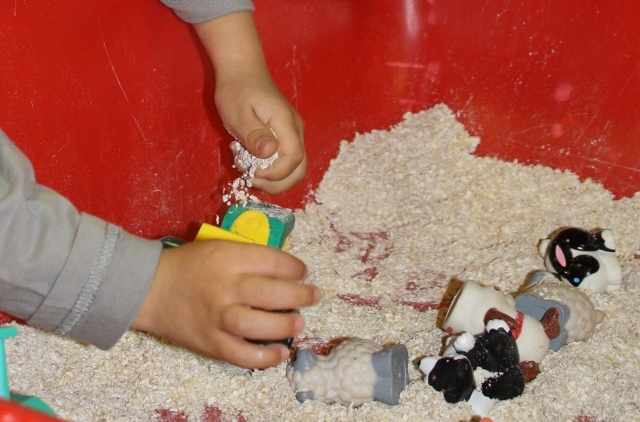 Children make valuable connections and discoveries while engaged in sensory play. dry pasta, seeds, beans, rice, popping corn, etc. shaving cream – add small blocks or plastic animals, straws for stirring, etc. Of course play dough is one of the most versatile sensory experiences. I’ll reserve space in the future for a full discussion on the benefits of play dough and ways you can extend that play. Watcht for that in a future post! If you are interested in more about sensory play, the blog No Time for Flashcards has a couple of interesting posts. Here is a link to one. 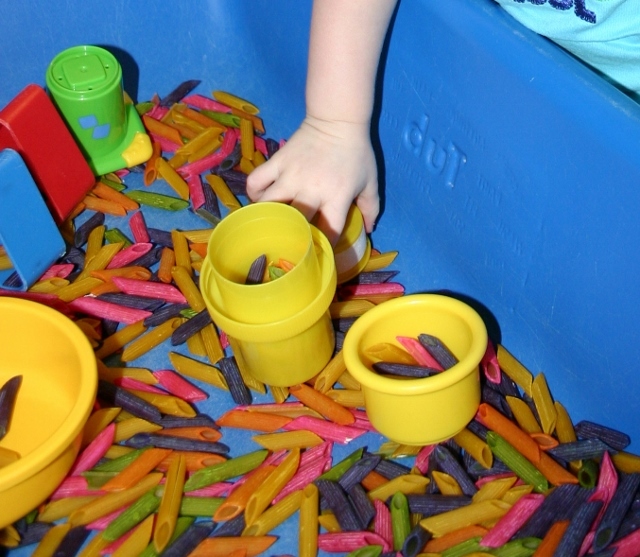 http://www.notimeforflashcards.com/2012/09/fall-farm-sensory-tub.html I encourage you to make time and space for this important play in your child’s days. Have some tactile fun! Climbing, wrestling, twirling: Kids need it! This time of year is a lot of fun at the preschool: we have acclimated to the routines and structure of the day, the weather is changing, and several fun holidays are upon us. It’s especially exciting to have our very own pumpkin patch right outside the door! We love to walk around the patch and compare the pumpkins, carry some around, and one of our very favorite things to do is pumpkin pounding! Pumpkin pounding is exactly as it sounds: we are literally pounding pumpkins with golf tees. Using play hammers, the children have so much fun engaging their muscles to one by one, pound the golf tees into the pumpkin. I was sharing this activity with a friend and she asked, “What is the purpose of doing this?” Actually, there really is no end product. The children pound for the shear enjoyment of it! But, pumpkin pounding is extremely beneficial for children of any age. It is what we would consider “heavy work.” Heavy work is important because it activates a child’s proprioceptive system. Our proprioceptive system is one of our hidden senses in our bodies that gives us information from our muscles and joints on our body position and where our arms and legs are in relation to our body. Children with problems with proprioceptive development are more clumsy, struggle with climbing, or may w sit on the floor rather than “criss cross applesauce.” They need heavy work activities to build up this sense and pumpkin pounding is an activity that is great practice as it works those upper body muscles. In a society that leads a much more sedentary lifestyle with technology and television, we are more intentional in implementing heavy work at the preschool. From our large motor activities, the activities on the playground, and things we do in the classroom like the pumpkin pounding, we know that children are satisfying some very important developmental needs when they are doing these activities. Children need to climb, run, wrestle, and carry heavy things. It is through this “heavy work” that they are regulating their internal body functions. When you see that your child may be more active or have that need to wrestle, it may very well be that he/she’s body is needing that heavy work to complete their developing sensory diet. As a result, you will find that after these types of activities, children are more focused, calm, and ready to engage in more cognitive activities.